Opel has revealed the first official details about the upcoming sixth-generation Corsa supermini model, which is set to arrive in the European market before the end of the year. Thanks to the adoption of PSA’s CMP architecture, the same one used in the latest Peugeot 208, the next Opel/Vauxhall Corsa benefits from a significant weight reduction, making it up to 10 percent lighter than the outgoing model. 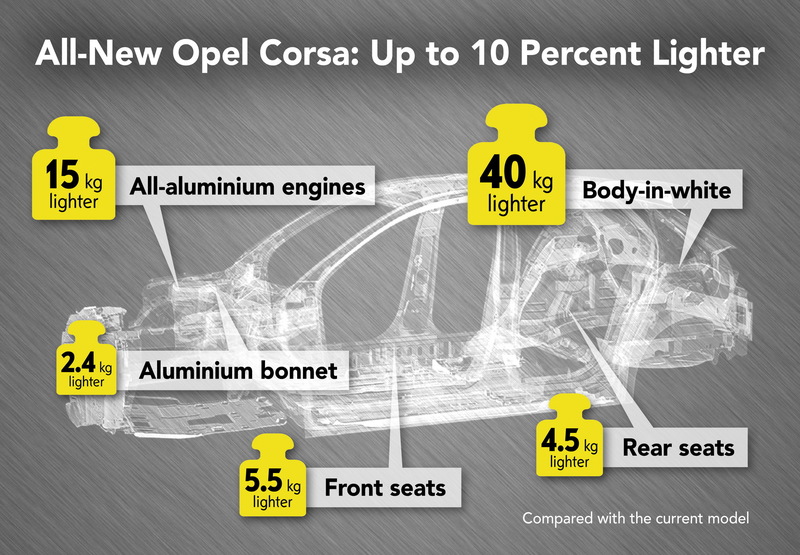 Opel goes as far as saying that the lightest version of the 2020 Corsa will tip the scales at just 980kg (2,160lbs), making it 108kg (238lbs) lighter than its predecessor and despite retaining a similar footprint. The weight savings came from various measures; for starters, the use of high-strength and ultra-high-strength steels make the body-in-white 40kg (88lbs) lighter while the new all-aluminum three-cylinder engines save another 15kg (33lbs). Body panels such as the engine bonnet are made out aluminum, saving an additional 2.4kg (5.3lbs) while the new optimized seat structure weighs 10kg (22lbs) less than the seats in the outgoing model. The 2020 Opel Corsa will employ PSA’s turbocharged 1.2-liter three-cylinder petrol engine offered in different states of tune, with the company also planning a full-electric version -just like the Peugeot 208- that’s set to go on sale in mid-2020. Despite the common platform and components with its French cousin, the new Opel Corsa is expected to feature its own design character, both inside and out. When it arrives in the market, the new Corsa will be available only with a five-door bodystyle. Opel has already teased its upcoming Ford Fiesta rival with a preview image showing its new adaptive LED headlights.